After more than 15 years living at our Galt sanctuary, Sheba, our lone female lionness, made the short journey to San Andreas and her new life with the Bolivia lions. After so many years in the peaceful Galt countryside, she is slowly adapting to new companions and new surroundings. Her South American friends watched her curiously at first, now they are all feigning indifference. Sheba's first steps into her spacious new habitat was an emotional experience for directors Pat Derby and Ed Stewart. They have planned and dreamed of a large habitat and companions for this gentle, sweet lion who was born in an exotic pet "puppy mill" and sold to live in a basement in Detroit, Michigan before she came to PAWS. Sheba has cautiously explored the habitat, watched the other lions and finally joined in the roaring contest for the past week. Today she approached Camba at the fence, exchanged a few warning snarls and ambled over to the shade of a tree. 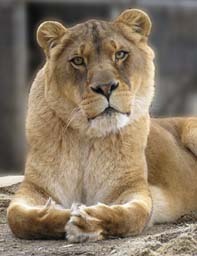 The big males watch her occasionally, but they are not as focused on her presence as Camba. Sheba rolls and gurgles with joy when old friends Pat and Ed approach, and she is adjusting to her beautiful new home and companions quickly. Watching the socialization process is always exciting, and each new day brings more discoveries about the complexity of lion society. The males are so devoted to each other and to Camba, sleeping in a tight formation with lots of touching and grooming. We hope Sheba will soon join this lovely pride. Thank you to Animal Defenders International (ADI) and Bob Barker for funding the lion habitat at ARK 2000, and to The Helen Brach Foundation for building Sheba's den. To view a video of Sheba's move to ARK 2000, narrated by Pat Derby, click here.